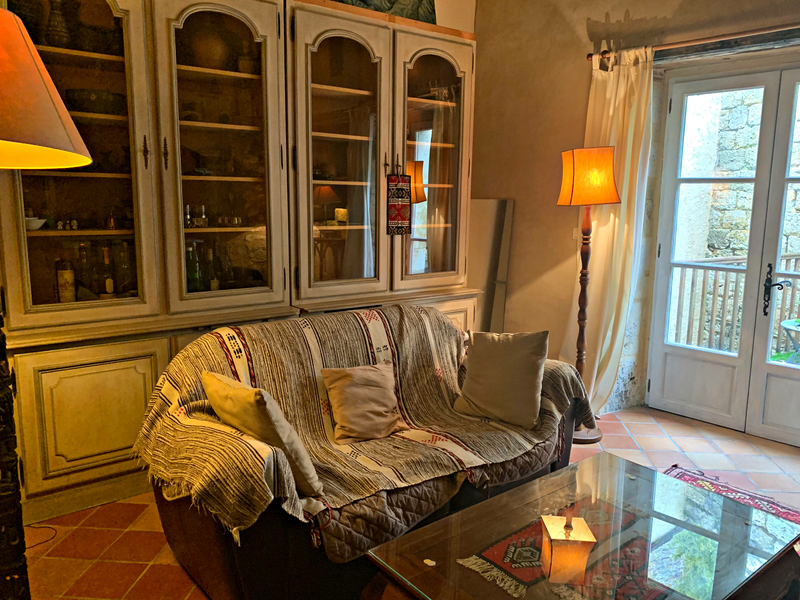 Located in the heart of Lectoure, this beautiful second-floor appartment offers exceptional views of Lectoure from the south, the north over the high street, and to the east. With the many shops, tea-rooms and restaurants on the doorstep of the building, not to mention the colourful Friday market and its thermal centre, Lectoure has become an increasingly desirable place to live over the last ten years, its popularity growing yet further with the opening of the antique village in the old hospital, which draws antique dealers and aficionados of collectibles, from vinyl records to clocks, to lamps, from all over the world. The original staircase to the second -floor winds past a shop on the ground-floor and a private appartment on the first floor. There are only three occupants to this building, a fourth loft appartment having a separate private entrance. In this way, there is little traffic, yet a sense of security is ensured from living in a closely preserved and protected environment. The residents live in harmony, without the need for a “syndic de co-propriété” (tenant association). The building which had lain empty for over half a century, was fully restored in the last fifteen years, and the current owners to the top floor appartment carried the works yet further, refurbishing the appartment throughout and replacing the existing floorboards with sound proof boarding, changing all the old-fashioned windows in keeping with the building, and refitting the beautiful bespoke kitchen. The appartment is exceptionally light and spacious, occupying as it does the entire top floor. The décor throughout is tasteful, light and bright, the pure white walls serving as a perfect backdrop to the view, and to the art work displayed there. Here we find all the elegance of an Haussmannian building, and but for the far-reaching views over the southern ramparts to the Pyrenees beyond, once could easily imagine oneself to be in a fine appartment building in Paris or Bordeaux. The main door opens onto a long and generous hallway, with beautiful new wooden parquet flooring. The salon and dining room have brand new double-glazed wooden framed windows to all sides, affording views both of the Cathedral of Lectoure, the roof-tops of Lectoure, and the south. Here, high above the roof-tops of Lectoure, there is a sense of being suspended high above the town, in an exquisite bubble, close to the clouds. There is little sense of the hustle and bustle of the town below. The apartment’s tasteful neutral décor allows a blend of contemporary artwork and stylish traditional pieces of furniture. The layout is open-plan, the reception-room, study area and the dining-room opening seamlessly out into the kitchen, although the grand 18th century double doors can be closed if so desired. The kitchen is spacious, with contemporary and stylish units fitted throughout, and a window to the east; and a door leading back to the main central hallway, offering a circular flow throughout. The appartment has a total of three bedrooms, a separate cloakroom, and two shower rooms, (one with WC). On the landing outside the main front entrance, there is a very useful private utility-room, with washing-machine and dryer, belonging to the top-floor appartment. Above this area there is access to the old attic, which offers storage room uniquely to the owner of the top floor appartment. This space cannot be converted into habitable space but is a very useful area to have and keeps the appartment decluttered. On the ground floor there is a private door to a section of cellar space reserved for the owners of the appartment, and where they store their cycles. This appartment would make a perfect home for a couple looking to live in the heart of Lectoure, without the upkeep of a garden. Located close to the local pool and municipal park, there is easy access to outdoor open spaces, and of course all the joys of being able to dine out, and have a glass of wine, without having to drive home. This is a perfect opportunity for anyone looking for a home that does not require further renovations. All works have been carried out to the highest standards, and there is a sense of peace and tranquillity within these walls. Equally this appartment could be used as a main place of residence (as is currently the case), a weekend getaway, or an investment in the town for a luxury lettings appartment. There is likely to be an increased demand for apartments to let, with the opening of the new casino, in a thermal town which is already incredibly popular both nationally and internationally. The location of this appartment could not be better as an investment on a rising market. This home will appeal to anyone looking for a home that is simplistically stylish, pure, and stripped back. A shiny pearl – which gleams in every sense, and reflects with perfect transparency, the pride the current owners took in its restoration!